Kids toy technology has moved so fast in the last few years, from Electronic Pets to Hoverboards, it really feels like we are living in the future now. Another piece of tech which is a popular gift for children is flying drones which they can control with a remote or even an app on their smartphone. Flying toys have always been popular – think of the joy a simple paper airplane brings, so imagine their joy at being able to control a drone in the air and take photos high above the ground. Now drones can be an expensive hobby, some models can run into the thousands so you wouldn’t want your child to take control of a model like that. Luckily, the technology has gotten a lot cheaper and there are now many models which cater to smaller budgets and are actually aimed at younger pilots. These toy drones will still provide hours of fun but they are lighter and easier to control and will not break your budget in the event of getting lost or damaged. That is where today’s guide comes in. We have researched all the available options on the market, pouring over specifications and technical manuals as well as getting hands-on with the featured models, lots of fun was had! Here we have picked our top 10 drones for kids and reviewed each one thoroughly, with an honest break down of the pros and cons of each one. If you scroll to the bottom of this guide, you will find our complete Buyer’s Guide along with an FAQ section to get you up to speed. If you are in a hurry, then these are out top picks. 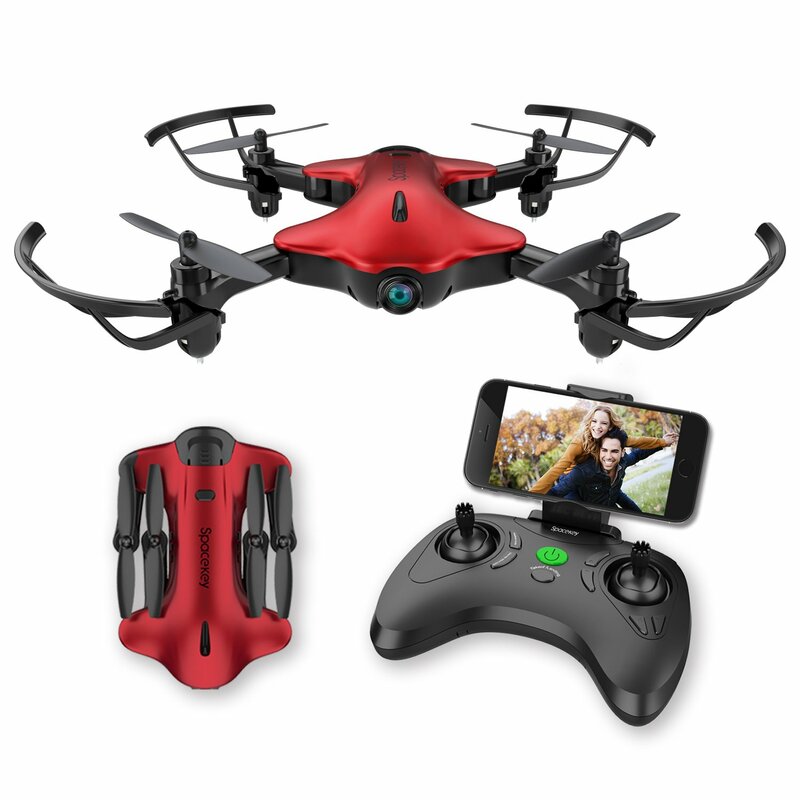 Altair #AA108 Camera Drone: A well-rounded drone for adults and children with features that match some of the elite drones. It is easy to fly and won’t cost you an arm or a leg to practice with. It can also be used indoors. 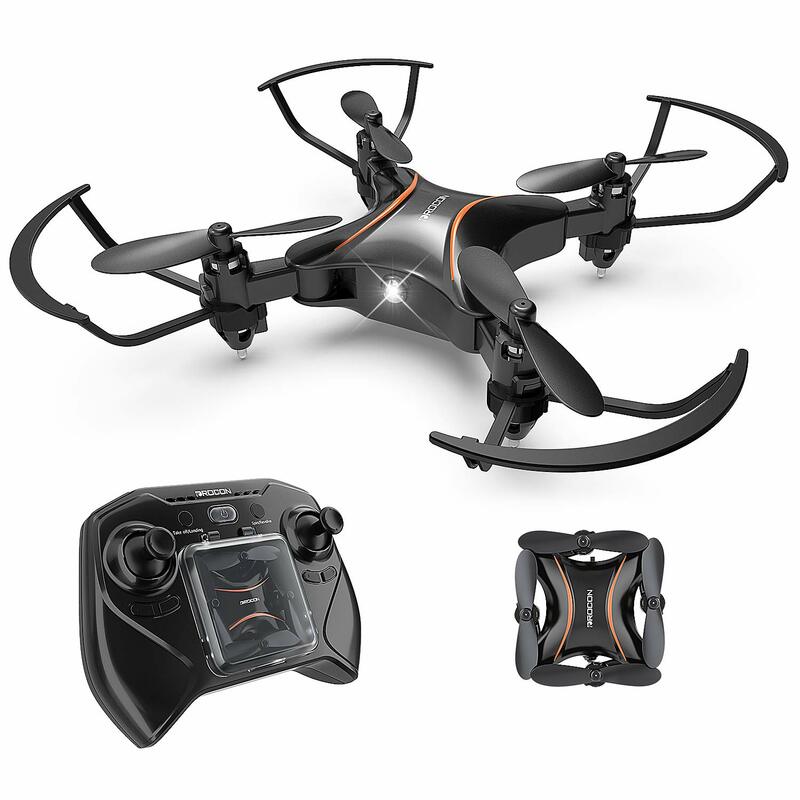 Drocon DC-65 Foldable Mini RC Drone: Drones can be large to carry and heavy to move around. However, this drone is slightly smaller and it can be folded to reduce some of the space it takes. It is perfect for children on the move. Altair 818 Hornet Beginner Drone: If your child is at an intermediate level, this drone will be perfect for them. It allows them to start taking pictures and even recording footage. It will need a little more practice to master all the features. DJI Spark: Considered one of the best drones on the market today, this drone is perfect for children of all ages. It is full of tech features that will make it stand out from the rest of the crowd and that is why we have included it for those who are willing to spend the extra couple of bucks. Altair is one of the leading brands when it comes to drones and drone technology. 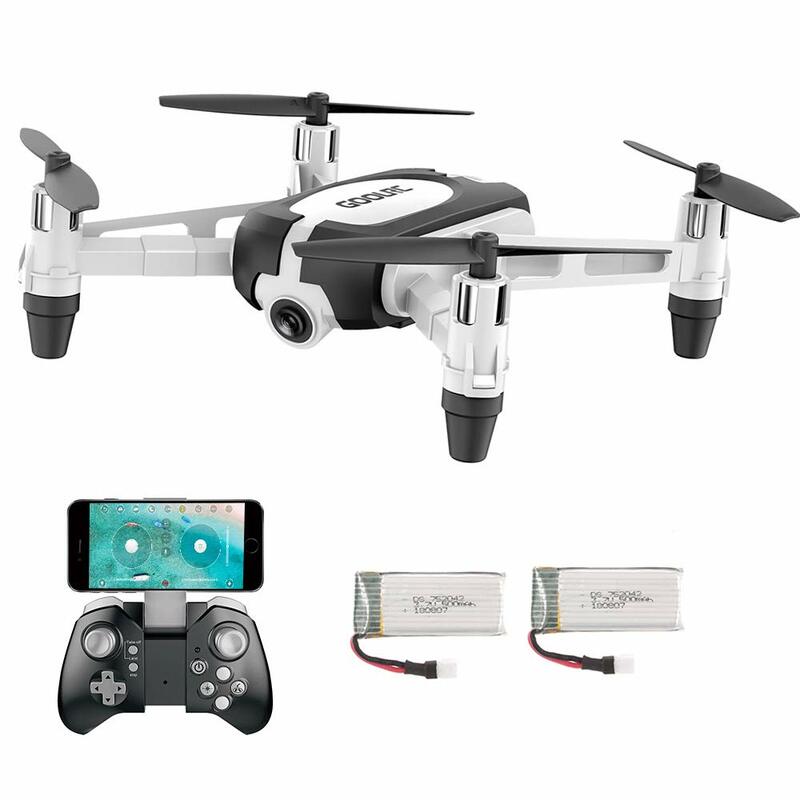 TheAltair #AA108 Camera Drone is an excellent option for children and beginners alike. Since it includes a camera that is capable of streaming video in 720p, your kid can record video footage of their adventures from a better vantage point. The flight time is around 10-minutes, which might not be much, but it is ideal for children. The custom flight pattern will allow you to set up a flight pattern beforehand. Now you can continue on your trip and the drone will fly all by itself. While this can be set up with your smartphone, it is not always needed if you don’t want to connect it. The drone features a state of the art control system. The control can be utilized manually or you can simply choose to use it with the headless mode. This will allow the drone to fly in the direction that you are pointing the remote. It sounds like more fun, but we definitely recommend training a little more before doing it. While this might not be the drone with a lot of key features, it certainly stands out as one that is easy to fly. If you are using all of the features, you might find that the battery does drop quite rapidly. However, it is so easy to control that users can actually choose to use it indoors. It is worth noting that the landing simply requires one button. When you are looking at drones, it is fair to expect them to be really expensive. However, this smaller drone is the perfect price for all the features that it includes. It is actually quite durable enough to resist a few falls and it comes with 2 batteries. We would recommend it to children or to adults for practicing with a drone. The Spacekey FPV Wi-Fi Drone with Camera is another excellent drone that can be used for capturing your favorite images as a child. The drone is stylish and it can be folded with ease. Once again it features a camera that can be used for recording or snapping images of your favorite shots. This camera has a 720p resolution at 30 frames per second. As we have mentioned, it features a foldable structure and this foldable structure is designed to make life a little easier when transporting the drone. It includes an APP that is downloaded on your smart device and this can be attached to the remote control to have a live feed of whatever you are streaming from the camera. As for the functionality, the drone has been designed to give you numerous operating features. One of them includes the altitude hold function. The altitude hold function will keep the drone flying perfectly straight when you get a little flustered with the conditions. As with many great drones, the landing and take-off can be controlled with one simple button. The drone comes with a couple of extras like your propellers and the durability of the propellers also seem to be on point. The downside is the fact that this drone is not as user-friendly as some of the others. It might be small and comfortable to use, but you definitely need to spend some time at home just practicing the flying. Since it is so affordable for the features that you receive, it has made it onto our list. It has all the same features and APP quality of the high-end drones. Once you have figured out exactly how it should be flown, the drone will definitely work for you. We would highly recommend it to children with a basic understanding of RC models. 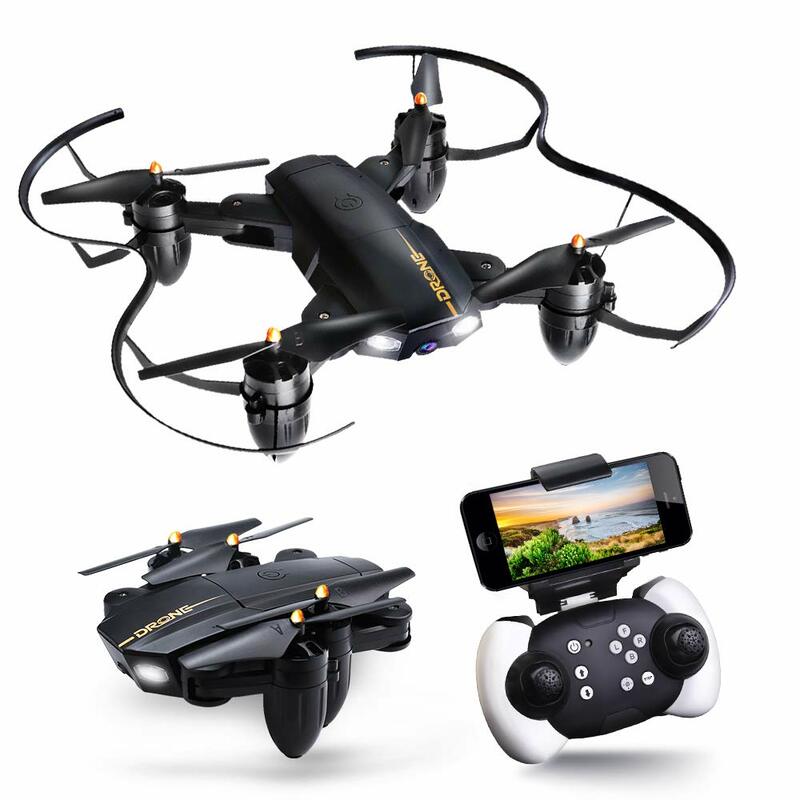 The Drocon DC-65 Foldable Mini RC Drone is one of the smaller drones that you will find on the market today. However, you should not worry about it being small as much as the operation of it being much easier than some of the larger options. The design looks great and stylish as well to ensure that you have a good looking drone. Much like the previous drone, this one can also be folded if you need to travel or carry it around. It comes with an excellent altitude hold feature that can be activated once you lose control of the drone. With the 3 different speed modes, children have the possibility to start out slow and build up their speed until they are a little more comfortable. The drone has a decent range of around 50-meters, but the battery only needs to be charged for 40-minutes and you will have up to 8-minutes of play time. The durability aspect is also something that we take into account and this drone includes propeller guards to keep it from breaking. Additionally, you have the one-touch landing feature to work with as well. The remote control does not have any labeling and this might be a little frustrating for new users to understand. You need to play around with the manual in order to understand everything about this small drone. The headless mode does lead to a few false activations and is not one of the best modes of this drone. It is available in 2 different colors and they both look great when you set them up. Since they have a few flaws when compared to the elite drones, the price tag is also on the lower end of the spectrum. Once you have mastered the remote control, you can also start performing those 3D flips. We would highly recommend it to beginners and kids. A hexacopter can be one of the most intimidating flying objects if you have never played with one. However, they are so much fun and offer the user a ton of control when flying. 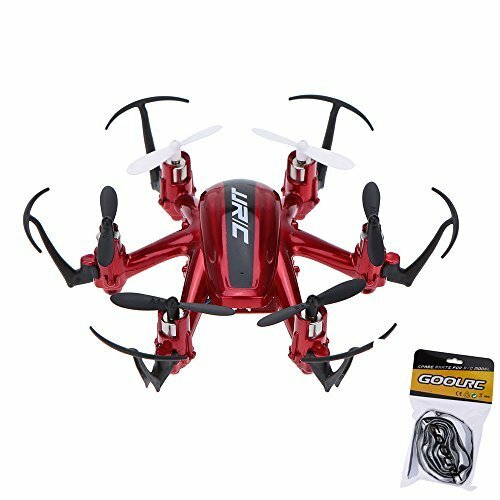 The Original JJRC H20 2.4G 4 Channel 6-Axis Gyro Nano Hexacopter Drone is one of these intimidating, yet extremely fun options for all drone enthusiasts. The design might not be foldable, but it is extremely compact. You don’t need to worry about too much when transporting the drone and looking to save space. The 6-axis gyro is one of the best features and it ensures that the drone maintains altitude and stability when it is flying. ABS plastic has been used for the construction with decent durability. When it comes to the flight aspects, this drone does not need to much time to be charged. The battery should be ready to go within 45 minutes and when used sparingly, you could use it for around 10-minutes. The additional lights make it possible to fly at night and it looks really stylish when you are flying in the night sky. The range is definitely not that spectacular, but it is still more than enough to allow you to have some fun outside. Since the range needs to be quite close and the drone is actually tiny compared to many of the others, it is ideal for flying inside. However, we don’t recommend having too many crashes with these propellers. When you look at anything with a 6-axis design and gyro technology, you might expect it to be really expensive. However, this drone is actually quite affordable and offers you many great features that can be used by beginners. We would recommend it for smaller and older kids to have some fun with before buying expensive drones. Altair is one of the leading brands when you are looking at drone technology for kids and at an affordable price. This can be seen quite clearly when looking at the Altair 818 Hornet Beginner Drone. 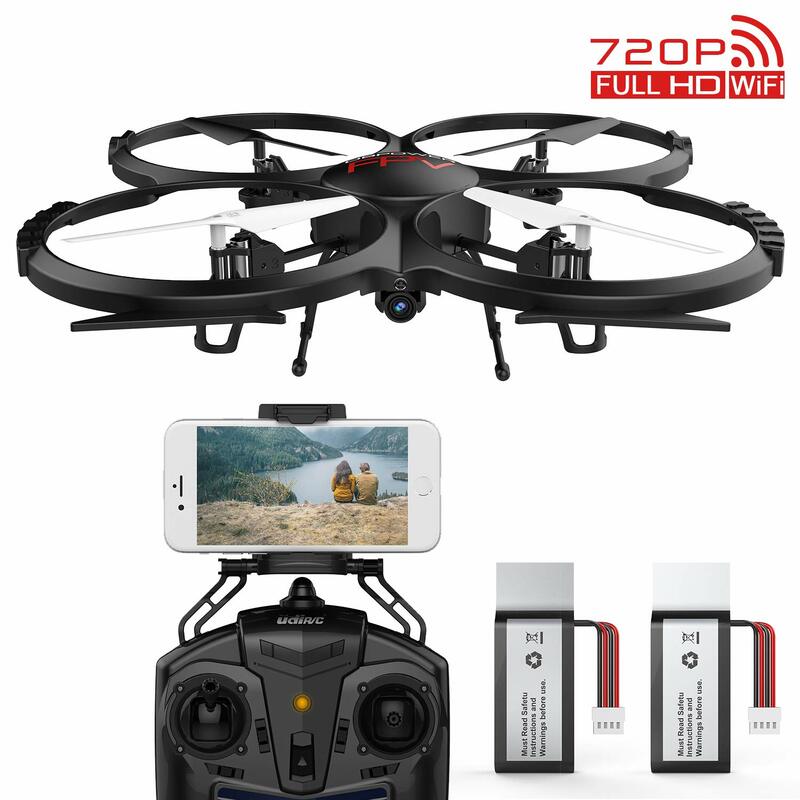 The drone comes with an advanced camera for capturing video footage in 720p HD at around 30 frames per second. One of the best features is that this drone comes with advanced remote control. The remote control features numerous settings that also include the skill setting feature. If you are a beginner, you can change the skill level to beginner to get you started, but for more of a challenge, you can remove some of the aids and have a pure flying experience. Since it comes with 2 batteries, you won’t need to worry about the frustration of having to run out of battery life at crucial times. 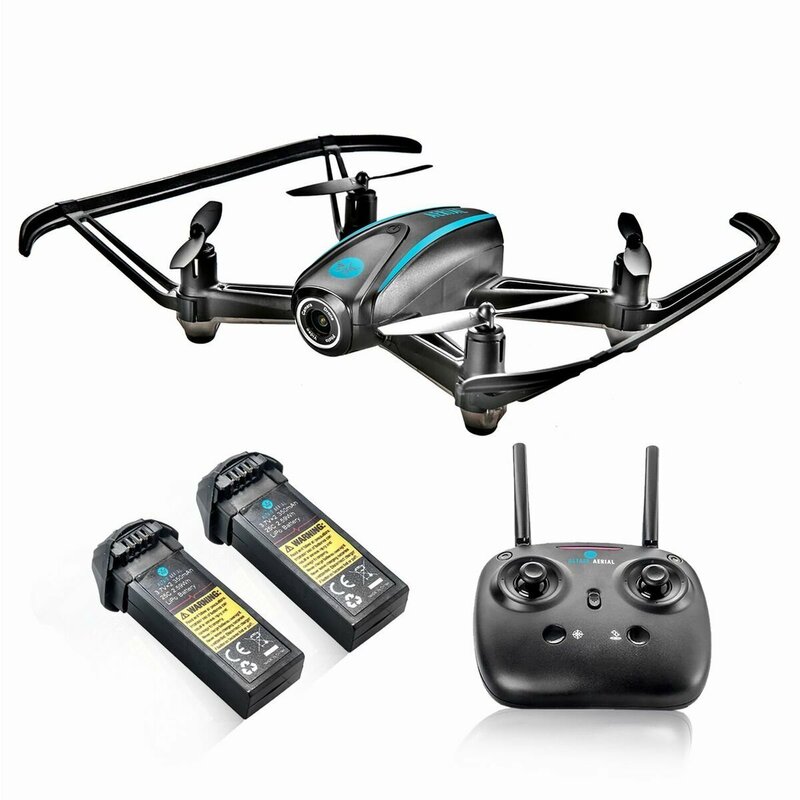 These 2 batteries will each give you around 30-minutes of flying time, which should be more than enough to capture some great footage. The headless mode does not trigger as many faults as some of the other drones do with this mode activated. When it comes to actually flying the drone, it is not only designed with Gyro technology but also features an orientation feature that will keep the drone steady. It can be landed with one simple button. The same button is also used for the landing to ensure you don’t have to crash it as a beginner when trying to figure out the landing. The only downside is the price and it is no secret that this is one of the more expensive options on the market today. However, these features are much similar to what you would find in some of the high-end drones on the market today. We would not only recommend it to children, but to all adults looking for a new drone and technology. One of my favorite drones is the JoyGeek Foldable FPV RC Quadcopter and this is simply because is one of the easiest options to operate as an adult. The drone is rather small and compact and once you need to travel with it, it can actually be folded as well. This will keep the propellers protected when you are not flying it. Much like the Altair drones, it also includes a camera and while the camera might not be the best, it can still capture some decent footage. 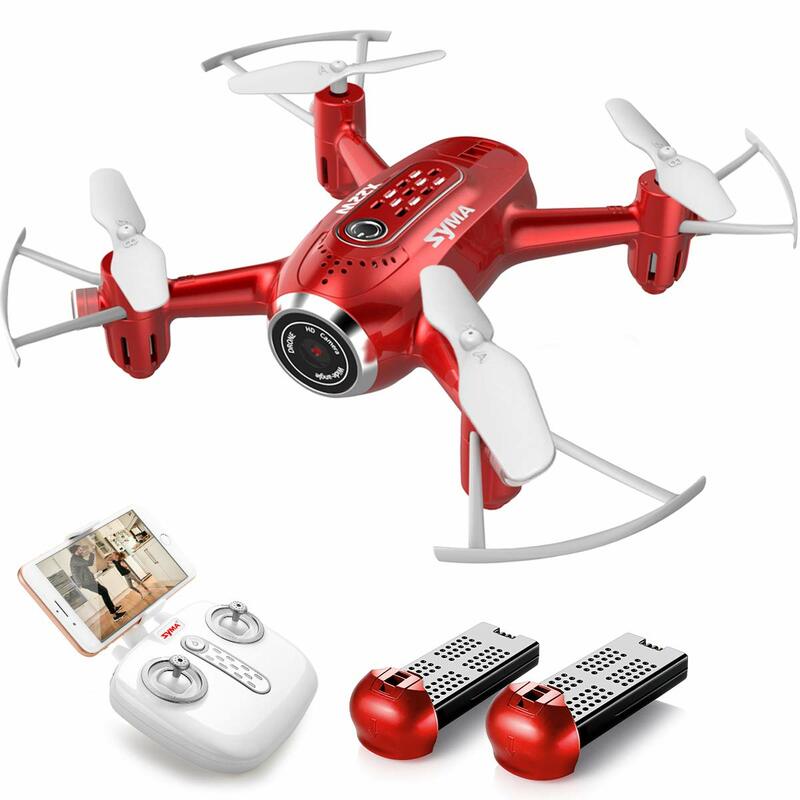 It does not include a memory device that allows you to record, but, you can still record footage with this drone when using the smartphone APP that is available for free and with few glitches. This drone can actually perform tricks as well when you are using it correctly, making a massive difference for children that are always trying to get the best out of the device. If you don’t feel like using your smart device, you don’t need to do it. You simply need to have a decent understanding of the remote control and use it. The downside to this drone is that it does take around 60-minutes to fully charge before the drone can be used again. Once it has been charged, you will only have around 6-minutes of playing to work with. Unfortunately, this is not the best part of the drone and you might need to buy a couple of extra batteries. When looking at the stylish design, this drone looks much more expensive than it actually it. It is one of the cheaper models on the market today and this is why the drone is popular among many children nowadays. If you don’t want to damage your expensive drone or you are looking for a drone for your kid, we definitely recommend this one. 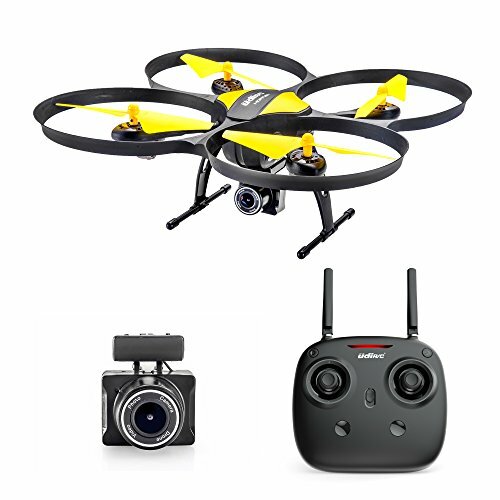 Camera drones are certainly becoming the staple of the drone industry and the DBPOWER Discovery WiFi FPV 720P HD Camera Drone is one of the top drones for children to experiment with and to help them understand how to fly with it. It has been designed with a 720p HD camera, capable of recording excellent footage quality. The FLYINGSEE APP is also included with this package and since the APP is virtually flawless, it allows users to live-stream some of the footage they like. Once again, the altitude hold mode will keep the drone floating at the same height while you regain some control if the wind might have spun it out of control. Depending on your skill level as a pilot, the drone has been designed with a functional remote control. The 2 different skill level features will give you a beginner’s experience. However, advanced pilots might like to have an even more authentic experience by limiting the functionality of the Gyro technology that has been added for support. Finding fault with this drone is definitely not easy and it comes with a couple of features that make it suitable for practice. However, the wind might give it a little bit of a beating and many people have complained about losing control. As with any toy, it is much better if you spend some time figuring out all the features before heading outside. The Altair drones have many of the same features that this one includes. Unfortunately, they do command a much more expensive price tag. This is one of the more affordable drones with a camera and live feed capabilities. If you love recording, this will be an excellent drone for older children to play with. The SYMA X22W Drone might not be the most advanced drone you can find, but once you start looking at some of the features and the design, it definitely looks professional enough. The drone itself is really small and this nano design is portable and easy to transport, We simply slipped it into our pockets when on the move. While it does come with an excellent remote control that makes it easy for beginners to understand, you don’t need to have the remote control. The drone can work wonders when simply using the APP on your mobile device. If you don’t like the landing and the take-off, this drone can easily be landed with the simple touch of a single button. Children, who would like to have more fun, can actually use the headless mode of the drone. The drone will simply fly in the same direction that you are pointing the remote control. Additionally, the Gyro Technology helps it maintain altitude and you will get around 8-minutes of flying time on a fully charged battery. Having a small camera added will allow you to capture footage while you are flying. The APP also allows children to live stream the footage as it is happening. However, the battery is already not the best and when you start adding the camera feature, it is reduced even more. You might need a couple of extra batteries. The general feeling about this drone is that it will be perfect for kids and beginners. It looks rather impressive and you might think it is only for adults, but the controls are easy to understand. While we believe that children will have some fun, we also recommend investing in an additional battery for more playing time. Another drone that caught our attention when it comes to children is definitely the GoolRC T700 WiFi FPV Mini Selfie Drone. 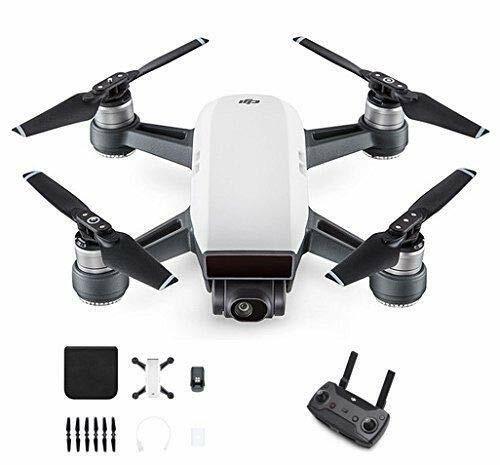 As you would expect from a selfie drone, it comes with a great camera that can capture 720p HD footage while you are also live-streaming all of this footage or even sharing it to social media with the APP. One of the main reasons for selecting this drone is the ability to perform stunts and children, especially those at a younger age, might enjoy some of the flips and rolls. The APP is virtually flawless and it also allows you to set up a trajectory. The trajectory mode will automatically control the drone while you are performing activities. The remote control is something that children will also like since it already resembles the remote controls that you find in most gaming consoles. It can be landed with one simple button and you can attach your mobile device to the unit. Additionally, the headless mode is perfect for beginners who don’t understand the remote setup. As with many of these drones, the battery life always seems to be lacking. One of these batteries will take around 60-minutes to be fully charged and it will only give you 6-minutes to play with the drone. Fortunately, GoolRC has included 2 additional batteries that will give you 3-times more playing time with the drone. Since the drone is designed for children, there is no use having it too expensive. Fortunately, the drone is really affordable and offers you some excellent value for your money. 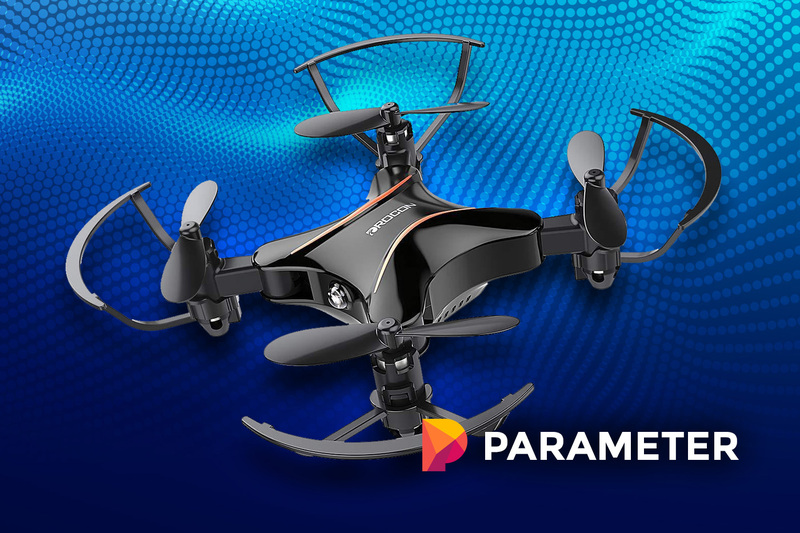 If you love drones and you are looking for something that will give you a lot of playing time, this will be one of the very best and most affordable options to consider. Last but certainly not least, we have included a drone that has a reputation for quality. The DJI Spark is rated as one of the best drones for vlogging and it is also not as expensive as some of the other elite models. Starting with the design, we can see that the drone is extremely well built with durable features and propeller protectors included. It comes with a 12MP camera that is stabilized with the 2-axis design of the drone. This camera is capable f capturing footage in full HD at around 30 frames per second, making it possible to stream all your activities. The DJI APP is also included and it features a flawless design and interface for every user to play with. One of the top features is the flight autonomy. This will allow you to continue with your activities while the drone easily flies around to capture the footage. It also avoids obstacles all by itself with a detector that has been added. For this reason, we believe that children can actually use it to learn a lot about flying drones. With a 31 MPH top speed, your drone will never be left behind. Should you need it to scout ahead, the range is an impressive 1.2-miles. Once it is out of range, the drone will automatically return home and if the battery runs out after 16-minutes, it will land automatically as well. Using all the features won’t reduce the battery time. As for the price, it is one of the most expensive drones you can find for your kids, but it will be one they can use for a very long time. The drone takes some figuring out, but it can be operated by almost anyone on the beginner level. If you have the funds and you are looking for one drone to practice with and use, we recommend the DJI Spark. Drone Size: Once you start looking for drones, you will immediately notice that they are available in a multitude of different sizes. Depending on your skill level, you will need to determine the right size to buy for your needs. Most drones are a normal size and occasionally, they can be folded for portability and protection when transporting them. For children, you can also find nano drones. The pocket-size drones are much smaller and they are easier to control as well. If your child is practicing and needs something to play with indoors, the nano-drone will be one of the best investments you could make. You should note that smaller drones don’t fare well in tough winds. Battery: Drones are designed for remote use and this means that they use batteries when it comes to flying around. You need to not only look at the size of the battery but also how long the battery will last. Doing the research, we have found that most batteries will last you around 10-minutes when looking at the averages. After the battery has been drained, it needs to be charged and the amount of time needed for charging should have a decent ratio with the time you are playing. For example, If your battery will last you 6-minutes, the charging time should be around 40-minutes. However, most brands also give you the option to purchase backup batteries. Gyro Technology: Most modern-day aircraft include Gyroscopic technology to help with altitude control and to maintain the stability of the aircraft. Gyro technology can be a real benefit for children to help them learn and understand some of the features. Should your kid lose control of the drone, the Gyro technology will help stabilize it for them to regain this control. Cameras: Having a camera is definitely a great addition to have. It is not mandatory but opens up a completely new world of experiences. With a decent camera, you can start recording footage and even upload it to social media. If you love adventures and going outdoors, we always recommend investing in some sort of camera. APP Compatibility: Drones can nowadays be operated with your mobile device and this makes it much easier for users if they don’t understand the remote control. The APP should be functional and allow you to actually monitor the drone with the key aspects. Having the automated trajectory feature added also allows you to have the drone fly, while you are doing activities. For the elite drones like the DJI Spark, you will notice that they have an obstacle sensor included. Instead of having to deal with all the fuss of searching for a fallen drone, this feature will automatically change the trajectory to avoid any obstacles. It is good for a wooded area or urban homes with a lot of buildings. Durability: Most drones are constructed from durable ABS plastic. This material is lightweight and it can resist a couple of bumps to the drone. When it comes to durability, we recommend looking for something that will help you. Additionally, you might be able to invest in a couple of extra propellers to help compensate for the first few crashes. Warranty: Last but certainly not least, you need to consider the warranty of the drone. These drones are expensive and they can have a few manufacturer defects from time to time. Having a good warranty will give you some peace of mind and ensure that you are protected. A warranty of at least 5-years is recommended for a drone. What Should I Do If I Lose Control? As a beginner, you are bound to have a few times that you will lose control over the drone. However, you should not panic and understand that drones are designed to take a couple of bumps. Most of the top drones will have an altitude control feature that allows you to stabilize the drone. This will be like a reset button to help start over. How Do I Land A Drone? The landing is one of the most daunting parts of flying a drone and it is even more complicated than lifting off. You need to have a lot of patience and a stable hand if you want to land it manually. However, you should look for a landing button on your remote. This will access the internal computer and the drone should land automatically. Are The APPS Free? Most of the APPS associated with these drones are generally free. Since the drone is expensive, you are paying for the features of the APP as well. However, many APPS do have features that you need to purchase in order to use them. They should not be too expensive and won’t cost you a monthly fee, but only once off. Is It Legal To Fly Drones? For the most part, it is legal to fly your drone. However, you might not want to fly it in an urban area as this can be considered invasion privacy. Drones can take images and many people are not allowed to take images of their neighbors. It is recommended that you find a secluded area for flying your drone to ensure that you are not stepping on any toes. How Old Does My Child Need To Be To Fly A Drone? Drones are like any other RC models and they don’t have a specific age that is required. However, you as the parent should make your own judgment to ensure that your child is the right age to play with drones. In this article, we have tried to stay away from advanced drones, making it ideal for any child to choose a drone from this list. If you are looking for the best drone, you might need to start looking a little more expensive. However, these drones are perfect for children. The Altair #AA108 Camera Drone is the best drone for kids on this list. It not only features a few things we have seen in the high-end models but also comes at an affordable price tag for beginners. We would like to thank you for reading this article and encourage you to share some of your thoughts on these drones. Let us know in the comment section which of them you prefer and if we might have missed any of your favorites. We would love to read your comments and add more drones to the list if you believe they deserve a spot.